There are many causes of car accidents, and pinpointing the cause is the first step in seeking compensation. Auto accidents caused by eating while driving can result in serious injury, including brain damage, paralysis, and even wrongful death. Eating while operating a vehicle is one of the most common types of distracted driving. If you have been injured in a car accident caused by another driver eating while driving, you may be able to obtain compensation for damages. Attorney Gary A. Zucker works out of his office in Brooklyn, NY. He may be able to help you file a successful claim for damages by determining the cause of the accident and proving liability on the part of the negligent driver. When most people think of distracted driving, the mind often goes to a driver that texts and drives. But reaching for an object in the backseat, adjusting climate controls or the radio, and any other activity that takes the driver’s attention off of the road is considered distracted driving. A driver who takes his or her eyes off the road is not able to refocus on driving for several seconds. In that time span a lot can happen, including the need to make a sudden stop, merge, or yield to another vehicle. A driver that is not able to make those evasive actions could cause a serious accident. Eating requires use of the hands, but so does driving. When a driver decides to eat while driving, they may not have a firm grip on the steering wheel and may not be able to respond to situations. When a driver makes the intentional choice to eat while driving, any injuries suffered in an accident could be the responsibility of that driver. A qualified personal injury attorney can take on your case and work to obtain the compensation needed to cover your expenses. As with any other type of car accident, victims are entitled to recover the costs of medical care, lost wages, loss of future earnings, the expenses associated with longtime care or therapy, and other costs associated with the accident. In order to make a full recovery, we must first establish liability, which is directly linked to the cause of the accident. 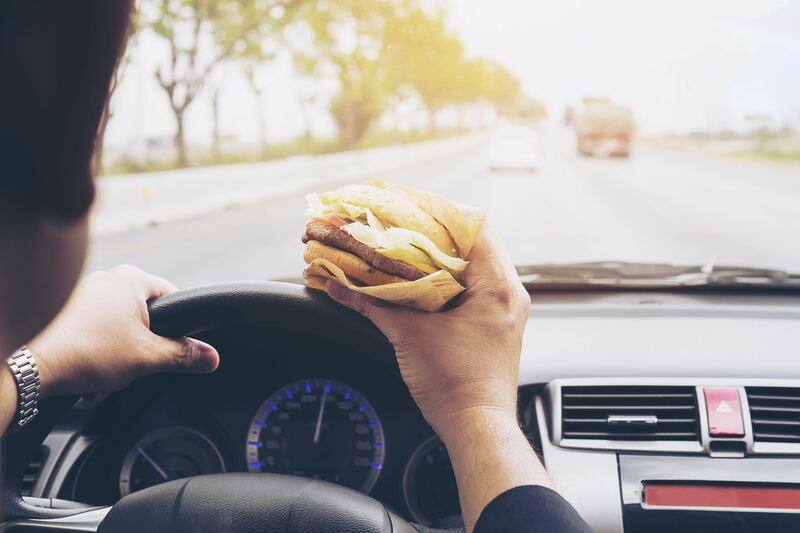 A driver who is eating while driving may cause an accident by taking their attention and focus off of the road, and in doing so may become liable for any injuries and property damage sustained in an accident. If you have been hurt in a car accident caused by a driver that was eating, call personal injury attorney Gary A. Zucker. To find out more, contact us online or call us at (718) 624-1211.